Founder and President Jeff L. Gorski started PFS Group in 2005, based on principles and methodologies acquired from over two decades in the healthcare industry. Since then, PFS Group has become one of the most successful, fastest-growing patient account management companies in the nation. By combining experienced professionals with cutting-edge technology and top-notch processes, our goal is to produce outstanding results for our hospital partners. From our inception, our objective has been to help your patients resolve their accounts efficiently, while achieving an outstanding perception of your organization. Jeff has been involved in healthcare receivables management for more than 25 years, providing revenue cycle solutions for healthcare providers, including large not-for-profit hospital networks and systems, individual hospitals and large physician groups across the country. As owner and chief executive officer, Jeff ensures that the services PFS Group offers are provided with the highest level of professionalism and attention to client and patient customer service. He makes sure that tasks are executed in the most-cost effective manner possible to exceed client expectations. Prior to creating PFS Group, Jeff was a founding partner of Patient Accounts Service Center (PASC), a large for-profit accounts receivable management company that grew over 12 years to include more than 1,000 employees. PASC served more than 450 healthcare client partners. Tom has been engaged in healthcare accounts receivable management for more than 25 years, providing revenue cycle solutions for health systems nationwide. He is responsible for all business development and marketing activities. He is active in all leading RCM trade organizations. Prior to joining PFS Group, Tom has maintained ownership and been engaged in both smaller and large national firms to bring expertise in the design and build of effective outsourcing opportunities for its current clients, as well as the creation of new hospital client relationships. Tom has worked with some of the leading health systems in the country in creating cost-efficient solutions to revenue cycle management. Tom is a graduate of Western State College of Colorado with a Bachelor of Science in Business Administration. Steve brings more than 30 years of healthcare receivable management experience to PFS Group, including 15 years working directly for large healthcare systems. His responsibilities include the overall leadership of PFS Group focusing primarily on strategies for PFS Group and our clients. Steve's experience has enabled him to successfully implement best practices that allow for PFS Group's seamless integration with our clients' patient financial services departments. 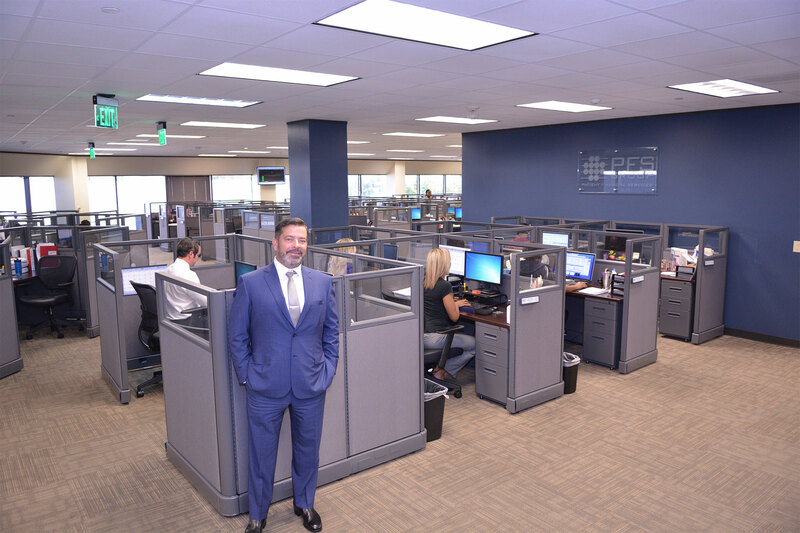 Prior to assuming a lead role at PFS Group, Steve spent six years with Patient Accounts Service Center (PASC), a large, national for-profit accounts receivable management company. His responsibilities included operational management, project management and sales. Steve also spent seven years with HCA, the nation's leading provider of healthcare services, as a Director of Patient Financial Services for several facilities within HCA. His responsibilities included process flow design and management of all facets of operations within patient financial services, including patient access, billing, collections and customer service. Steve is a graduate of Sam Houston State University with a Bachelor of Business Administration in Finance and has maintained memberships in HFMA and AAHAM since 1989. Jennifer has been involved in the healthcare finance industry since 2002. Her responsibilities include client relations, project management, regulatory compliance and contract implementation. Active in healthcare organizations including all facets of revenue cycle, Jennifer is a Certified Medical Practice Executive (CMPE) through MGMA, a Certified Revenue Cycle Executive (CRCE-I) through AAHAM and a Certified Professional Compliance Officer (CPCO) through AAPC. Trained in Lean process management, Jennifer is a Six Sigma Green Belt and is currently studying for her PMP. Prior to joining PFS Group, Jennifer managed commercial accounts receivable teams for CHRISTUS Health System and directed cash application efforts for a large Houston practice management firm specialized in radiology billing. Jennifer is a graduate of the University of New Mexico with a Bachelor of Arts Degree in Journalism and Mass Communications. Marty began his career as a media and entertainment investment banker at Merrill Lynch and has been involved in the healthcare industry since 2001 when he founded HEALnet (Hospital Entertainment and Leisure Network), a company dedicated to bringing Internet and movies to hospital patients. In 2004, he sold the business to an investor group and founded Gables Ventures, a creative and investment firm focused on content, design and technology. At PFS Group, Marty led the launch of affiliate company PatientRev ®, a SaaS online billing and payment solution that enables healthcare providers to enhance and accelerate revenue collection and streamline the billing process. In addition to overseeing PatientRev, he also spearheads marketing and new business initiatives for PFS Group. Marty is a graduate of Columbia University, an award winning filmmaker, and resides in Texas with his wife, newborn daughter and dog. Kay Cupelli brings almost thirty years healthcare human resource management to PFS Group. After graduating with a Bachelor’s degree from the School of Business Technology at the University of Houston, she managed a construction company office briefly before entering the field of Human Resources. While Kay’s Human Resources career has been focused in healthcare, the experiences have been very diverse – multi-specialty, multi-location clinic; single specialty multi location provider; multi-state assisted living; and single office group health/workers’ compensation TPAs (third party administrator). Kay spent nine years in all facets of human resources at Kelsey-Seybold Clinic including recruitment, benefits, training, and wage and salary administration of employees, physicians and physician extenders. Thereafter, she then applied that general knowledge as the Director of Human Resources at Health Administration Services, later TriSurant, for thirteen years. Other appointments have been at Hearthstone Assisted Living and Texas ENT Specialists before joining PFS Group in 2013. As head of the Human Resources function, her responsibilities include planning and directing HR activities involving benefits, compensation, recruitment, employee relations, performance management and payroll. She provides daily education and guidance to management and employees alike to help improve and promote employee morale. She also is responsible for ensuring proper legal compliance and consistency of company policies and programs company-wide at the various locations. Kay is very detail-oriented and fast-paced, focused on quality and accuracy, and is passionate about teaching those who want to learn. Kay has been married for more than thirty years, has three kids, three dogs and one awesome grandson. She is a true local, being born and raised in the Houston area, and living only five streets away from her childhood home! Jason has been involved in the healthcare industry since 1995. His healthcare experience covers a wide-ranging area, including the creation of a data warehouse for all of HCA's billing, payment and PS&R data with feature-rich mining and audit tools. He prototyped a telemedicine Web application for physicians in remote locations, enabling them to leverage their expertise across the country. He has developed a variety of Medicare-related software, ranging from eligibility lookup to PS&R audit. Prior to joining PFS Group, Jason created the income and sales tax processing system still in use today at the Louisiana Department of Revenue. He has consulted at some of the largest energy companies in the world, helping to streamline their energy trading credit management process: Shell, Merrill Lynch, Constellation Energy, TXU, Reliant Energy, Florida Power & Light, American Electric Power, BC Hydro (Vancouver, Canada), E.On (Munich, Germany) and StatOil (Stavanger, Norway). At PFS Group, Jason and his team have designed and deployed more than 600 applications which manage client interfaces and audit the A/R process, helping to ensure that PFS Group consistently delivers top-notch service. Jason is responsible for managing software development, client interface deployment and the overall IT/IS infrastructure. The mission of PFS Group is to help our clients and partners achieve 100% patient satisfaction and operational excellence by providing cost effective resources and technology that bring real value to their business processes. PFS Group is committed to quality and unparalleled customer service in all aspects of our business. Our objective is to exceed expectations. Our success is built by creative and productive employees working as one who are encouraged to think “outside the box” and feel free to make suggestions to improve our level of service. Our primary goal is to live our mission statement and help us continue to be an industry leader. Teamwork. We collaborate and share knowledge to benefit our clients for the advancement of our mission. Service. We strive to exceed our clients’ expectations. Compassion. We demonstrate our commitment to world-class service by providing a caring and supportive environment for our client’s patients.